Father Earl Mahan has been a Priest since January 23, 1994. He comes to St. Louis and St. Luke’s by way of Wichita, KS, where he served at St. John’s Episcopal Church for 5 years. He has two children, Trevor (age 18) and Mikayla (age 15). 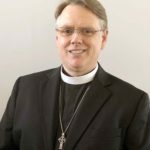 A graduate of Concordia University and Seminary of the Southwest, Father Mahan enjoys movies, books, dogs, and the San Antonio Spurs.